Early Belief in the Myth. Earliest Trace in Jewish Literature. In the Zohar and in "Kol Bo." Possible Oriental Origin of Myth. "Be wise at length, wretched Jew, be wise even though late! The first generation of man from dust without male or female [Adam] and the second from the male without the female [Eve] thou darest not deny in veneration of thy law. The third alone from male and female, because it is usual, thou approvest and affirmest with thy hard heart [brazen face?]. But the fourth, in which alone is salvation, from female without male—that, with obstinate malice, thou detested to thy own destruction. Blush, wretch, blush, and at least turn to nature! She is an argument for the faith, and for our conviction procreates and produces every day animals without either male or female." Such argument failed to convince Jews of the truth of the Immaculate Conception, though they toobelieved the myth. How long before Giraldus the fable existed, Max Müller is not able to determine. It is therefore significant that it was already known to the Venerable Bede, the father of English history (673-735). He says, in all earnestness, in his work on natural history, "De Natura Rerum," that the goose "Barliata" grows on rotten wood by the sea. It hangs by its beak until it falls. The earliest trace of this fable in Jewish literature seems to be in the "'Iṭṭur" of Isaac ben Abba Mari of Marseilles (about 1170). The reference is found in a volume of manuscript responsa (Halberstamm, , p. 66) in the following words: . Rabbenu Tam's (about 1100-71) opinion is given in the responsa of R. Meïr of Rothenburg (about 1225-93). In discussing the question whether such birds must be slaughtered according to the ritual method (Responsa, ed. Lemberg, 1860, p. 12b, § l60), he says: "My teacher, the Lion [Sir Léon of Paris = Leo Blundus? 1166-1224], told me that he had heard from his father, R. Isaac, that R. Tam directed that they should be slaughtered after Jewish fashion, and sent this decision to the sons of Angleterre [England]." According to Jacobs, this is the earliest notice of the legend; and it militates against its alleged Irish origin, since R. Tam, who was a grandson of Rashi, lived before the conquest of Ireland. R. Tam allowed them to be eaten. Jewish scholars in France and Germany discussed whether they were fish or fowl, and whether, according to the dietary laws, they were permissible as food. Some authorities answered in the affirmative; others declared them unlawful. R. Samuel Haḥasid of Speier (about 1150), and his son, R. Judah Heḥasid of Regensburg (died 1216), allowed them to be eaten, if, in common with other species of fowl, they were slaughtered after Jewish fashion. An anonymous Hebrew translator of the French cosmography called "Image du Monde," who compiled his work in 1245, speaks of geese growing on trees in Ireland and of people with tails in Brittany. He is the first Jewish author to locate the birds on Irish shores. 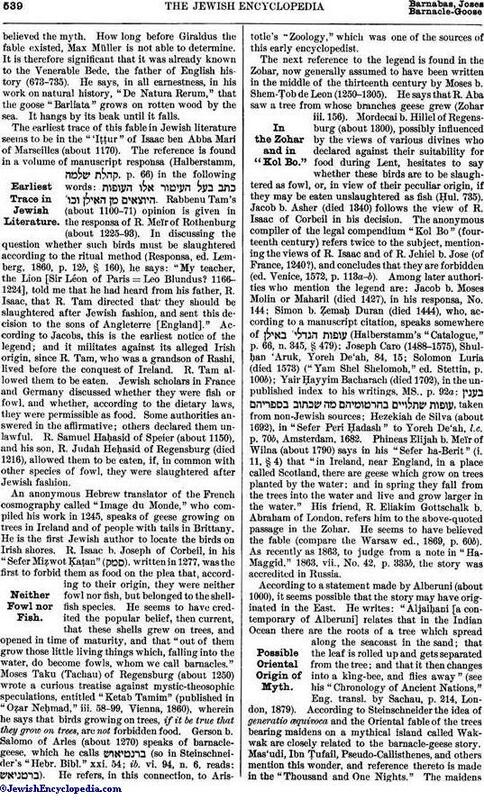 R. Isaac b. Joseph of Corbeil, in his "Sefer Miẓwot ḳaṭan" ( ), written in 1277, was the first to forbid them as food on the plea that, according to their origin, they were neither fowl nor fish, but belonged to the shellfish species. He seems to have credited the popular belief, then current, that these shells grew on trees, and opened in time of maturity, and that "out of them grow those little living things which, falling into the water, do become fowls, whom we call barnacles." Moses Taku (Tachau) of Regensburg (about 1250) wrote a curious treatise against mystic-theosophic speculations, entitled "Ketab Tamim" (published in "Oẓar Neḥmad," iii. 58-99, Vienna, 1860), wherein he says that birds growing on trees, if it be true that they grow on trees, are not forbidden food. Gerson b. Salomo of Arles (about 1270) speaks of barnaclegeese, which he calls (so in Steinschneider's "Hebr. Bibl." xxi. 54; ib. vi. 94, n. 6, reads: ). He refers, in this connection, to Aristotle's "Zoology," which was one of the sources of this early encyclopedist. The next reference to the legend is found in the Zohar, now generally assumed to have been written in the middle of the thirteenth century by Moses b. Shem-Ṭob de Leon (1250-1305). He says that R. Aba saw a tree from whose branches geese grew (Zohar iii. 156). Mordecai b. Hillel of Regensburg (about 1300), possibly influenced by the views of various divines who declared against their suitability for food during Lent, hesitates to say whether these birds are to be slaughtered as fowl, or, in view of their peculiar origin, if they may be eaten unslaughtered as fish (Ḥul. 735). Jacob b. Asher (died 1340) follows the view of R. Isaac of Corbeil in his decision. The anonymous compiler of the legal compendium "Kol Bo" (fourteenth century) refers twice to the subject, mentioning the views of R. Isaac and of R. Jehiel b. Jose (of France, 1240? ), and concludes that they are forbidden (ed. Venice, 1572, p. 113a-b). Among later authorities who mention the legend are: Jacob b. Moses Molin or Maharil (died 1427), in his responsa, No. 144; Simon b. Ẓemaḥ Duran (died 1444), who, according to a manuscript citation, speaks somewhere of (Halberstamm's "Catalogue," p. 66, n. 345, § 479); Joseph Caro (1488-1575), Shulḥan 'Aruk, Yoreh De'ah, 84, 15; Solomon Luria (died 1573) ("Yam Shel Shelomoh," ed. Stettin, p. 100b); Yair Ḥayyim Bacharach (died 1702), in the unpublished index to his writings, MS., p. 92a: , taken from non-Jewish sources; Hezekiah de Silva (about 1692), in "Sefer Peri Ḥadash" to Yoreh De'ah, l.c. p. 70b, Amsterdam, 1682. Phineas Elijah b. Meïr of Wilna (about 1790) says in his "Sefer ha-Berit" (i. 11, § 4) that "in Ireland, near England, in a place called Scotland, there are geese which grow on trees planted by the water; and in spring they fall from the trees into the water and live and grow larger in the water." His friend, R. Eliakim Gottschalk b. Abraham of London, refers him to the above-quoted passage in the Zohar. He seems to have believed the fable (compare the Warsaw ed., 1869, p. 60b). As recently as 1863, to judge from a note in "Ha-Maggid," 1863, vii., No. 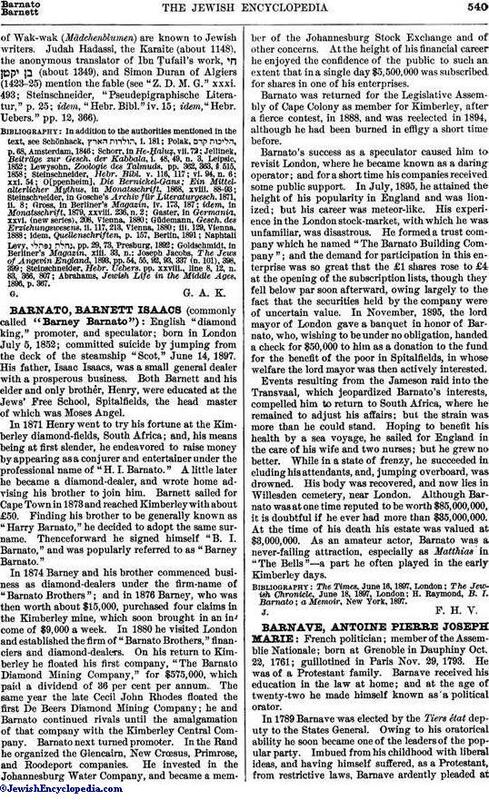 42, p. 335b, the story was accredited in Russia. According to a statement made by Alberuni (about 1000), it seems possible that the story may have originated in the East. He writes: "Aljaiḥani [a contemporary of Alberuni] relates that in the Indian Ocean there are the roots of a tree which spread along the seacoast in the sand; that the leaf is rolled up and gets separated from the tree; and that it then changes into a king-bee, and flies away" (see his "Chronology of Ancient Nations," Eng. transl. by Sachau, p. 214, London, 1879). According to Steinschneider the idea of generatio œquivoca and the Oriental fable of the trees bearing maidens on a mythical island called Wakwak are closely related to the barnacle-geese story. Mas'udi, Ibn Ṭufail, Pseudo-Callisthenes, and others mention this wonder, and reference thereto is made in the "Thousand and One Nights." The maidensof Wak-wak (Mädchenblumen) are known to Jewish writers. Judah Hadassi, the Karaite (about 1148), the anonymous translator of Ibn Ṭufail's work, (about 1349), and Simon Duran of Algiers (1423-25) mention the fable (see "Z. D. M. G." xxxi. 493; Steinschneider, "Pseudepigraphische Literatur," p. 25; idem, "Hebr. Bibl." iv. 15; idem, "Hebr. Uebers." pp. 12, 366). 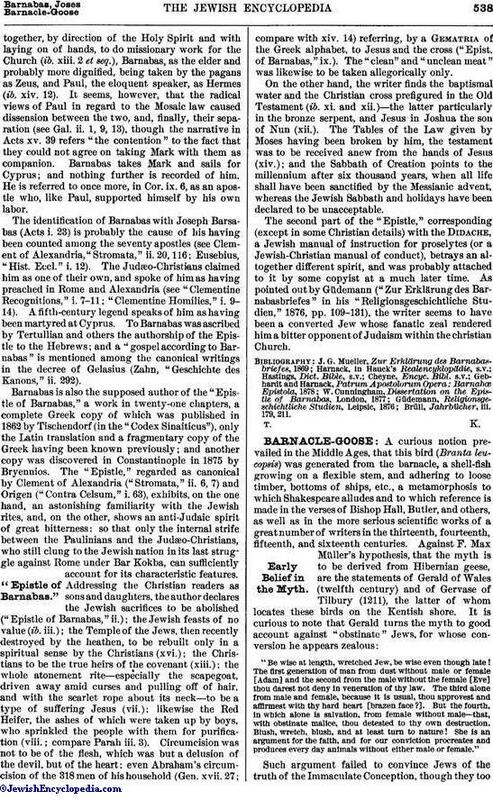 Abrahams, Jewish Life in the Middle Ages, 1896. p. 367.